Use the navigation bar on the left or the map-links to select a place. Alternatively scroll down to see all the entries. Click on photos to enlarge. See New Zealand 2009 photos here, and 2010 photos here. Myself and a friend arrived in Christchurch just after midnight, we had only a few days to pick up our campervan and drive to the other end of south island where we had booked to walk the Milford Sound trek. Hence our time in Christchurch was limited to a few hours. Things were on their way to recovery after the previous year's earthquake, and the residents were of course unaware that another even more devastating one was only months away, so the town was in good spirit and looking almost recovered. The main square was pleasant and shops busy. We had a walk and some lunch and then Mike took the first leg and drove the afternoon down to Lake Takapo. Lake Takapo is very beautiful. Up on a plateau, the lake is backed by the mountains of the Mount Cook National Park, and the water is crystal blue. We arrived late afternoon and parked up in a camp site. We went straight over to the lake and had a walk and watch the sun set over the mountains before heading back and making dinner. This was the first night in the motor home so we were not sure how comfortable it would be. In fact it was very nice, although very cold. I am not sure how cold it was that night but it felt freezing and even when the temperature got close to zero on other days of the trip it never felt cold in the van, so I guess it was well below zero. The following morning we had a look around a very beautiful little church by the lake and then it was my turn to drive for the day as we headed over to Queenstown. This was my first experience at driving a camper van, and the first time in nearly 10 years I had used a manual gear box, so it was a little daunting, but other than a few embarrassing stalls I mostly survived alright. We got into Queenstown after lunch so had the afternoon to look around. First we took a gondola up to the top of the hill with views over the lake, and after a quick look around the town, had a wander down to the lakeside. 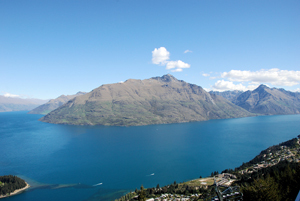 The main reason to stop off at Queenstown was to stock up on equipment and food for the Milford trek. The recession was still being felt in New Zealand, so the clothing shops were still providing many sales and this was not a big challenge. The following day we headed onward to Te Anau. Te Anau is the gateway to Milford Sound, and the trek which is rated as one of the greats in the world. Hence Te Anau has a few tourist places and not a great deal else. We wasted the afternoon sorting out our stuff and had a good meal. The next morning we wandered back into town, then parked our moterhome in the overnight car park and caught the bus with the other hikers to ferry which takes people across the lake, and to the trek start. The first day of the trek is easy going as the path heads up a wide valley. We were dropped off early afternoon and were lucky to have nice weather; the area is one of the wettest in the world. This first stretch of the path has some side trails to take walkers to look at interesting sites such as old trees and areas of marsh land. While the going is easy in the distance the snow capped mountains are quite visible and by the end of day one the path starts to enter the tighter walls of the upper valley. The trek is very limited in numbers and quite expensive, even for the basic options; however, the three huts stayed in over the course of the walk are of high quality and even have good toilets. On the first evening the hut manager took us out and showed us some of the local vegetation and told us a bit about the area. The spring had come late, and this followed by a warm spell had lead to a massive spike in the numbers of sand flies. These were in the air everywhere. When moving the sand flies find it hard to land and it takes them a while to bite, however the sheer numbers of them in the evenings meant that bits were inevitable, which can be painful and last a while. Hence in the evenings everyone stayed in the huts as much as possible. Day two was also a short day, but the path started to climb into the mountains. The hut was again nice and we were lucky with the weather. We had brought dehydrated food bought in Queenstown which was surprisingly good, although the portions a little meagre, and by day three we needed energy as the path began a steep assent to the highest point on the trek. On the western side of the mountains the weather was still nice, but the moment we crested the hit the rain, which barely stopped from that point on. Not surprising as this area receives over 13 meters of rain a year. There was still snow on the mountaintops, and in fact the week before the wardens had been out with grenades clearing the snow; however the main path was still at the mercy of avalanches so we had to use the emergency route which headed rapidly down following streams. This was a beautiful path however, as the constant rain provides many waterfalls and the lichen grows thick on the trees. We arrived at the final hut very wet and immensely glad of the wood fire hath to warm up and dry out. The final day is meant to sport many great views, however the rain was in full pelt and so it was a case of putting the head down and trekking out of the valley, and on to the ferry. Such was the weather that everyone arrived well ahead of schedule and the first ferry was packed. This took us to the Milford Sound resort area and we took a cruise out to see the iconic fjord land. As luck would have it the rain abated, so we had great views, and it was very enjoyable. We than go the bus back to Te Anau to dry our stuff and recover. The next port of call after some driving was the Franz Josef glacier. We had driven past Fox glacier, which is very similar, although Franz Josef is larger and better known. On the first afternoon we arrived we walked around the foot of the glaciers and had a walk in the surrounding area. The glaciers themselves are quite large, although not overwhelmingly so, but the valleys they have receded back along are wide and littered with the rocks ground out for the hillsides. Our main aim was to catch a helicopter up on the glacier itself and do a tour around the ice caves. The first afternoon the cloud cover was too great so we retreated to the bar and then, in bright sunshine turned up the following morning. We were told that tours were running, but the first available was midday. Throughout the morning we watch the clouds gradually build. We got dressed up in our ice gear and were about to head for the helicopter when word came that the cloud had thickened too much and the tour was cancelled. A bit of a shame, we considered waiting another day, but time was a valuable quaintly as it was just over a week before of ferry to North Island, so we instead headed further up the coast. Just up the coast from Greymouth is an area known as Punakaiki, or pancake rocks. As described the rock are shaped like stacks of pancakes, but the area is quite large and provides an interesting stopping point, especially if you have been driving for many hours, which seems to be mandatory when travelling New Zealand. We had a quick break and then continued, first to a deserted gold mining town nice in the heart of the South Island which now has a nice camping area many miles form any houses or building, and then on to Hanmar Springs for a soak in the warm geothermal waters. Next stop on this tour was the back on the east coast, and the town of Kaikoura. This is a beautiful town in its own right with ocean and mountains, but we had been recommended to come here specifically for the whale watching. I have been on a number of whale watching tours and more often than not been a little disappointed, however this was an exception. It was the right season and we had some luck and saw two whales up close, followed by the most energetic display from a school of dolphins I have ever seen. We stayed the night and then were off again, trying to cover as much ground in the evenings as possible to leave the days free. 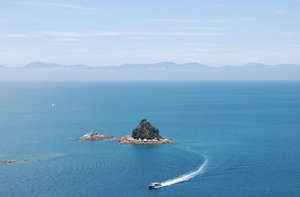 The final place we visited on South Island was the Abel Tasman nature reserved, up on the northern tip of the island. This is one of the sunniest places in New Zealand and definitely has a tropical look to it, although the cooler air gives away its non equatorial location. The walking in this area is again first class, and we spent a day doing part of the trek that covers the whole reserve. The weather was nice, the view spectacular, so was a great place to visit. The following day we hired kayaks and went on a tour of the area by sea, seeing some of the more secluded coves and islands and spotting a number of seals. A long day of exercise was topped off with a long drive back to Picton to catch the ferry the following morning. It was a windy Friday afternoon when myself and Heather arrived Wellington. We were met by our friends Patricia and Chris, also ex-Sapporo residents, who live along the coast from Wellington in the lovely town of Paekakariki - New Zealand specialises in hard to pronounce place names. The town has a great view of the sea and is close the small island of Kapiti, the destination for out first day. Kapiti Island is special because over the last hundred years continued efforts have removed all non-native animals such as cats and rats. This has allowed the indigenous New Zealand birds to survive, and the island is a thriving habitat for species close to extinction elsewhere. We followed the trail to the island peak which provided great views back to the mainland as well as over to South Island and along the way saw a good number of birds. On the way back down we met a native parrot known as a Kaka. These are impressive brown coloured birds with large beaks that are very clever and sociable. Long ago they learned that food is kept in rucksacks, so they now jump onto unsuspecting tourists and use their beaks to open zips in their hunt for an easy meal. Once one rucksack has been tested the bird systematically moves to the next which is a little daunting due to their size and confidence to climb all over us. On the Sunday we went to the some of the parkland surrounding Paekakariki and then went to see some of the sights of Wellington. The following day we had another wander around town, and then picked up our hire car to allow us to see some of the rest of the North Island. Chris and Patricia have a great garden and so we were treated to a lot of good food with home grown vegetables and plenty of homebrewed beer, so it was a shame to be moving on, but New Zealand has so many beautiful places and there is so little time to see everything. After a quick look around wellington on our 2010 trip the plan was to then walk the Tongariro crossing, rated as one of the best day walks in the world. However upon arrival we discovered the weather was too grim, and we would be unable to climb the following day, we hence rearranged our plans slightly and pushed on Rotarua. 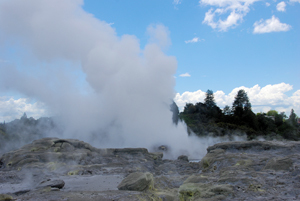 Famous for its boiling mud and geysers Rotarua is one of New Zealands top tourist resorts. We had much of a day so went to the large out of town park, where a stiff entrance fee allows you to see a wide range of geothermal wonders as well as a good deal of Mori heritage. While a little expensive I would say the park is well worth it, and it was certainly a well spent morning. That evening we headed back towards Tongariro to find that the forecast of the following day was blue skies and excellent walking weather. 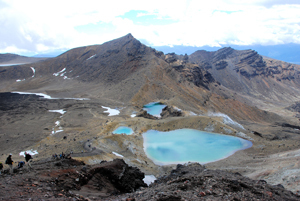 The Tongariro alpine crossing was the number one thing we wanted to do on North Island, and everyone we had met and said how good the walk was. While given quite high expectations the walk exceeded everything I had though. It starts with an easy climb up towards the volcano, with impressive views and volcanic rocks strew everywhere. 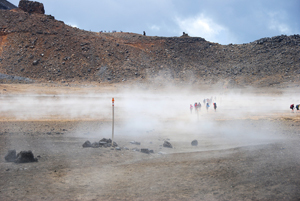 The path then levels out on a plateau where first you walk through thin clouds of volcanic steam, followed by a rapid rise up and over a ridge. This leads to a view out over the area used to film Mordor in the lord of the rings. While we were here we even witnessed a small volcanic explosion in the near distance. After some more climbing the path crests and opens up a view of several volcanic lakes, further along we walked over a short stretch of snow and then continued to move out of the main volcanic area and back into heath land. This finally dropped back into green forest and small streams. The shear variety of vista in such a short space of time is very impressive and the views at all stages of the trek are spectacular. I think this was probably the most memorable day of the holiday, and I, like everyone else, thoroughly recommend the walk. 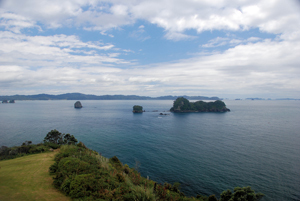 The Coromandel is just to the east of Auckland. It is slightly off the main tourist path but is still busy in peak season. The views are nice, again with small islands, and at one beach we hired spades, and along with about 50 other people dug out holes in the sand which filled with hot water rising up from the ground. We also visited a gold mine and learned some history of the area. It was a nice few days before heading to Auckland. 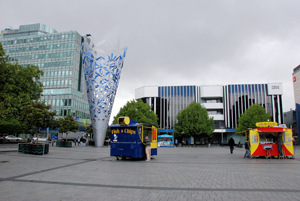 On first impressions Auckland is quite a generic city; it has the international feel of Sydney and much of the same shops and buildings; that is not to say it is a bad place, just nothing of great substance to write about. The excitement of having more that one lane to drive in was over all too quickly over as we ditched the car at the airport and headed into town. To make the most of our time we had decided to spend our final day dolphin watching so this gave us the Friday afternoon free. After wandering around the centre and harbour we headed out to the aquarium which specialises in having a polar ride where you can see lots of penguins and then a big aquarium with a glass tunnel so you can walk below sharks and other exciting fish. We finished the day at a steak house, then the following day headed down the harbour to take a boat to go whale and dolphin watching. This was run by some very knowledgeable people, and we saw a large pod of bottle nose dolphins which had a great time playing with the boat of 30 minutes. 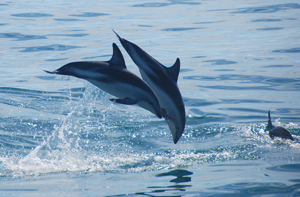 We then crossed the path of hundreds of small dolphins. They were not interested in the boat and the skipper though maybe they were swimming away from a killer whale, these are seen regularly in the area but unfortunately we did get to find any. That all but completed our New Zealand trip, but South Island beckons. 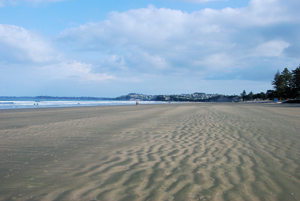 Orewa is a seaside resort to the north of Auckland. I met Jana here at the end of my 2010 trip. The town is nice enough and has an excellent beach. It gets quite busy in summer but we were just before the peak season. We spent a couple of days relaxing by the beach before I flew back to Sydney and Jana carried on down to South Island. Leaving Wellington we drove north towards the town of Taupo. It is around 350 Km, only slightly hampered by the fact that I hadn't really driven a car in 10 years, and only then to pass my test. But the roads in New Zealand are quiet, especially in the off season, so it didn't matter and the scenery was amazing (I'm told, I mostly had to concentrate on the roads as they do take a very meandering route requiring constant attention). We stopped in the town of Bulls (where the milk is made of course) and then near Taihape where a gorge cuts through the land. There are all manner of attractions to amuse the tourists here, I opted out of the bungee but went for the 160Km per hour flying fox that drops straight down the canyon, which was fun and upon being winched back up gave a great view of the gorge. Many winding miles later, past the mountains and lakes we made it to the town of Taupo. We stayed in a convenient motel - Taupo is a major tourist town, so is full of hotels and is very quiet in the off season, and went and ate at an nice Thai restaurant. The following morning we headed out of town to Huka falls. This is not so much a waterfall as a very narrow gorge filled with white water. While the falls are impressive from the side it is much better to take a jet boat up to the very bottom of them, and as a bonus the boat is designed to be quick and agile, providing a more exhilarating ride, as to be expected of something kiwi. Following on from this we headed up stream a little further to another gorge. At 12 o'clock the flood gates on the dam are opened to give an impression of what the river looked like before the construction of the reservoir, and it is quite a sight to see so much water flooding through the ravines. From here we continued to drive on what I think are some of the nicest roads I've ever seen, if rather winding, to the geothermal area of Orakei Korako, or the hidden valley. The lonely planet rates this as the best thermal area in New Zealand, and that says something for a country specialising in geothermal activity - from one area close by the hot water is used to produce over 15 percent of the countries power. Orakei Korako has a number of attractions from a hot spring in a cave to bubbling mud, geysers (small ones) and lots of steam. Again we were mostly lucky with the weather as the showers managed to be mainly while driving and in between we had bright sunshine. From here we moved on to Rotorua which is another hot spring town which smells rather of sulphur but has some excellent restaurants and cafes. Lamb is a speciality of New Zealand, and they can really cook it well, giving excellent flavour and keeping it really tender. The following morning we had an early start and drove to the caves of Waitomo. 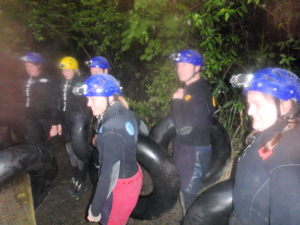 The Waitomo caves are one of the must see attractions of North Island, a massive complex of caves where a variety of activities are put on to cater for everyone. We started with the walking tour where a guide shows some of the larger caves and then takes you on a boat to see the thousands of glow worms that the caves are famous for. In the dark the glow worms look amazing so it is nice to know that they are basically a form of maggot that lets down a sticky web to catch flies, removes the romance a tad, but even considering that the sight of so many is quite stunning. While taking a boat over the icy black water is nice, a more exciting tour is to take car inner tubes and go caving and tubing into the dark interior of the earth. We were lucky to miss the large tour group so there were 6 of us on the tour and we not only saw the glow worms up close to see their webs but were taken to a really impressive hall of stalactites and stalagmites. However the best bits where splashing through the dark water and jumping off the little waterfalls. That evening we went to another excellent restaurant that did tapas using a fusion of Maori and westerns ingredients and recipes, then stayed in a very interesting place that specialises in odd buildings. It is possible to sleep in a converted plane, train or ship, but the star attractions are the hobbit holes. These are really nicely furnished and the furniture is specially built to make you feel small (like a hobbit, not insecure).